I'm back from a camping trip into the Rocky Mountains. Fun stuff! Of course, it would have been more fun if I didn't have a cold the whole time (or was it really bad allergies?) 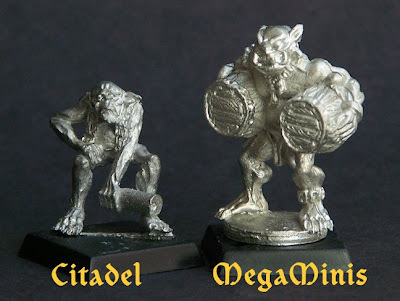 Anyway, upon my return I was happy to find my mail box contained a small package from Mega Miniatures. Mostly I got a bunch of animals and skeletons, but I also ordered one of their new Orc Villagers. I thought it would be good to take a comparison shot with the only other orc villagers I know of—an old set by Citadel. So, here you go! As you can see, the barrel-carrying orc towers above the old Citadel villagers. However, I should point out this is the largest model of the Mega Miniatures set. The rest of the bunch are a bit smaller. All of MM's orc villagers, would blend nicely with GW's current line of Orc models.